The geographical name Weequahic means different things to different people, conjuring up various members that are dear to anyone who has ever lived in this part of Newark. Today, let's look at the Park, the area's Jewish history, and its World War II military past. Certainly, Weequahic's best-known landmark is the handsome 79-acre lake around which the park rests. 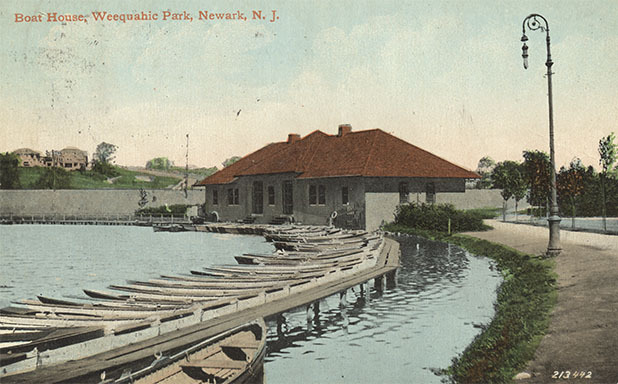 The 311.24-acre park, the second largest in Essex County parks system, was laid out in 1897 after the land was purchased from the old fairgrounds. Created from former farmlands, a racetrack and swampland, it became a major recreational draw for families 'moving up' into a newly built residential section on the town's southern outskirts. Originally, the Essex County Parks Department intended it as a reservation, but later developed it into a more planned setting. Only a few feet above sea level, the lake is surrounded by gently rolling hills, a golf course, and a once-famous trotting track. According to the city's history, Robert Treat and the city's other founders first landed in Newark in 1666 in the vicinity of today's performing arts center along modern-day McCarter Highway. Newark 250th Anniversary Committee of 1916 re-enacted the founding by having tens of thousands of 'modern-day' Newarkers dressed in colonial garb at Lake Weequahic participate in a gigantic historical pageant. While times have changed, the park still boasts beautiful trees which include the American beech, Osage orange, and Cucumber and Japanese cherry trees. For sportsmen, it offers ball diamonds, basketball courts, boating, fishing, football fields, an 18-hole golf course, outside ice-skating, a soccer field, tennis courts and a picnic ground. Interest in the park is not limited to the county's efforts. A community support group, the Weequahic Park Association, now supports this splendid outdoor resource. To Newark's Jewish community, Weequahic meant a place to live, grow, and prosper. Although they did not originally migrate to this section of town, Newark's Germans, Russians, Poles and Austro-Hungarian Jews arrived in what is now the Central Ward in the middle of the 19th century, settling along Prince Street. From there they moved to High Street and the Clinton Hill section. Newly arrived and generally poor, Newark's first Jews worked, lived and worshiped in modest surroundings. In just a short time, they prospered, building great houses of worship, including B'nai Jeshurun, B'nai Abraham, Oheb Shalom, and Ansie Russia. With success came mobility out of the Central Ward into attractive new homes throughout Weequahic. For 20 years, the great social and cultural High Street, the YM-YWHA, drew large audiences. It, too, eventually followed the move to Weequahic. While great institutions such as the houses of worship, parks and schools form the bulwark of any community, it is the little things that people tend to remember, such as the Hebrew classes at Weequahic High School, the rose garden and moonlight walks in the park, canoeing on the lake, a great meal at the Weequahic Diner, the fact the Philip Roth may have been a classmate at Weequahic High School, or that future New York City Mayor Ed Koch studied at South Side. While not all old memories are good, we tend to hold onto the good ones. Many of them occurred at Weequahic. From 1943-67, the center of Weequahic Park served as an Army installation for the U.S Atlantic Overseas Air Material District. Thousands of tons of war-time material were shipped to through Newark to the European Theatre. At first, all activities were located at the port. Then in 1943 many of the transactions were moved to Weequahic. The 2,500 military men and women christened the post 'Wic Wac.' In 1943, Gov. Charles Edison signed a lease agreement with the Army for an annual rental of $24,000. Soon, more than 100 pre-fab barracks were built, and a 118-bed hospital was located in the middle of the old trotting grounds. Great care was taken by the Army to build around the park's trees and natural resources. Soon, all traces of the 18-hole golf course were transformed into an efficient military base. At the entrance, a new sign read 'U.S Army War Department Military Reservation Keep Out.' This meant business until the spring of 1947 when the sign was replaced with a friendly greeting: 'Welcome to Weequahic Park.' As World War II wound down, operations were gradually transferred back to Port Newark. The dispensary was moved to the old Sears building at the Port. In November 1946, Major Fred Nelson, former camp commander, closed the installation. So ended an unusual three-year history in the park's history.